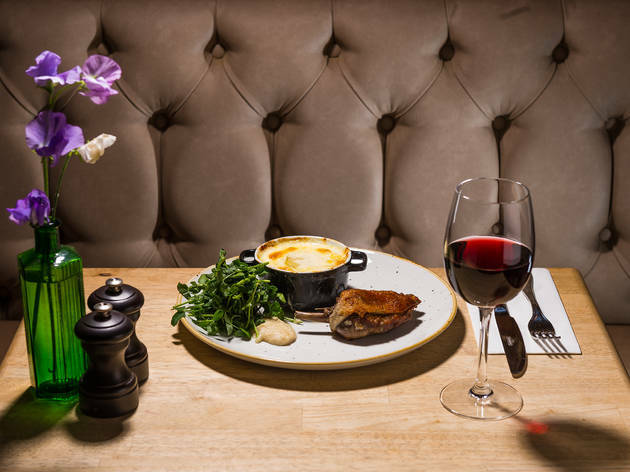 A lively little French restaurant on Hoxton Square. 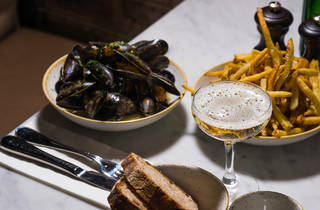 You could easily miss this tiny French bistro, sandwiched among the loud, look-at-me drinking and eating joints of Hoxton Square. But step through the door and Petit Pois’s character becomes clear. With its handful of tables, leather banquettes and small kitchen visible at the back, it has a friendly neighbourhood vibe that’s pleasingly off-kilter for the area. When I arrived, the manager was running around clutching a mixing bowl full of chocolate mousse, dolloping it on people’s plates. In my head, I’d already ordered it. An hour later, I was glad I had. This is one of those places where the restaurant meets diners halfway. Staff are fun and helpful but not fawning, and the menu is limited while being confident and familiar. 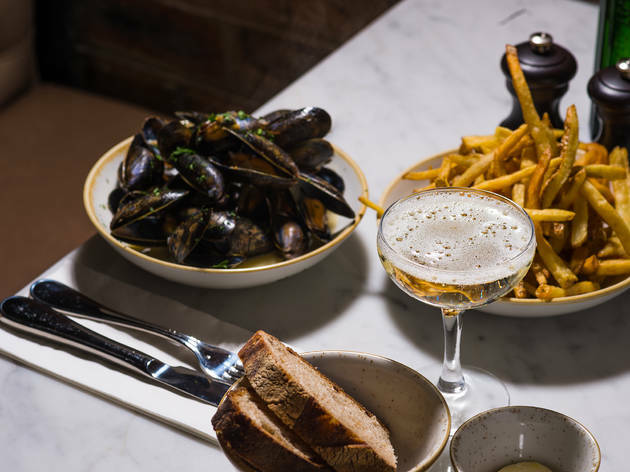 It’s not about fancy cooking or fussy sauces – it’s about a small selection of classic dishes done very well, at prices that aren’t exorbitant but honour the obvious care taken over standards like moules frites and potato dauphinoise. They offer four starters, four mains and two desserts. That’s it. I tried the steak frites with béarnaise – good meat and better sauce, although the chef’s definition of ‘rare’ was more English than French (the latter being bloody, but tastefully so). Two other things about the menu weren’t very continental, this time in a good way. First, there’s a non-token veggie option – a rich dish of fennel, haricot beans, confit garlic and red cabbage. Second, that veggie option is very good. London now has so many Gallic ex-pats it’s been called France’s sixth biggest city, and there’s certainly nothing foreign or exotic about French cooking anymore. Petit Pois runs with that reality, offering familiar food, simply but very well done. It gets my vote. Give peas a chance. 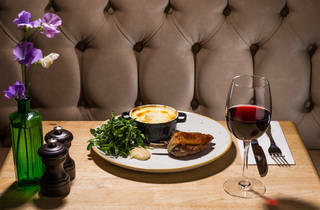 Dinner for two with drinks and service: around £100. Cute little French bistro with a upmarket suburban feel. Food was pretty good, had the steak and frites, foie gras and chocolate mousse. Chocolate mousse was the only thing to write home about but overall a nice dinner and experience. Don’t think it’s worth going back however! 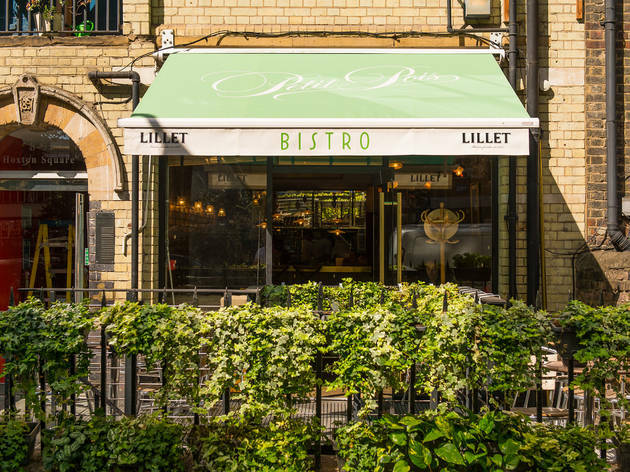 I'd booked this place and knew my wife would hesitate as French cuisine isn't her favourite but I think with this place I've changed her mind, as every dish, was a hit so much so we order more and even a dessert, which is the highest praise I can give! Really was not that impressed when I came here on Friday night. I had a Time Out voucher for 50% off food, however the total bill still came to £90 and I really don't think it was worth that much. We shared some small plates and one large plate, and a dessert - the celeriac and the cabbage were nice but all the other dishes were really bland. We found the service over-powering and annoying - every single dish suddenly the waiter would pop up and ask how it was, and it made things quite uncomfortable because we really weren't enjoying the food that much. They don't have a great wine list either, and we felt really rushed by the waiter while we were there. I wouldn't return or recommend it to others. I’ve been twice as I booked a few timeout vouchers for this Hoxton Square restaurant. My first experience was not that great. I went for a main and a dessert. Let’s start with the dessert. It was a chocolate mousse. I never felt so heavy after a dessert. I did not even finish it; it was pretty nauseated. As a main I took the steak! I was dreaming of it! I got pretty unlucky as my piece of meat wasn’t tender and I had a few tendons in it. My second experience was actually amazing! I went there with a big apprehension and I got a really good surprise. I went for a starter and a main. The pumpkin and goat cheese plate was huge and delicious! Every ingredient was going super well together and the different textures were really well used in the plate. For a main, I took the pork, which the waiter actually recommended. I was so good! Melting on the tong! I do not regret I went a second time, and I will base my rating on my good experience only! I recommend you go, but don’t try the mousse! You’ll make a good one at home without a doubt! 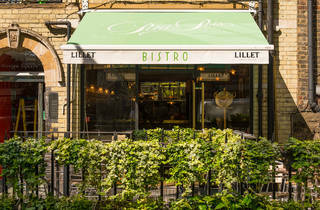 Petit Pois is the perfect local Bistro in London. This restaurant is everything you want for a date or dinner with friends or family: amazing food, great and affordable wines and an intimate and laid back atmosphere. Every time I think that I've had everything on the menu, they do a few new appealing dishes that I can’t wait to try. So I will be back again. And again. And again. Really like Petit Pois a lot, the food is great - make sure to leave space for desert, the chocolate mousse is not to be missed! - staff friendly and good atmosphere. Have been a couple of times for both breakfast and dinner and always been impressed. The food at Petit Pois is absolutely gorgeous. The fish melts in your mouth and chocolate mousse is out of this world. The cozy atmosphere really makes you feel at home and it's the kind of place you could just spend hours chatting and eating. Staff are super friendly and excellent at what they do.